Harriett is the Victorian embodiment of all the virtues then viewed as essential to the womanly ideal: a woman reared to love, honor and obey. Idolizing her parents, she learns from childhood to equate love with self-sacrifice, so that when she falls in love with the fiancé of her closest friend, there is only one way to confront such an unworthy passion. She convinces him to marry the friend. How could they hurt so deeply the friend and still live with themselves, is her position. He marries the woman, but never loves her, and the woman, in a probably subconscious attempt to keep him near to her, develops a kind of hysterical paralysis, which eventually leaves her bedridden. Meanwhile, life drags on for Harriett, her father’s bad investments make him a pauper, and they move from their comfortable spacious home to a dreary small house. He declines physically and mentally, and finally dies, and later the mother dies of cancer, leaving Harriett alone with her principles and a maid who pities her. May Sinclair was the pseudonym of Mary Amelia St. Clair, a popular British writer who wrote about two dozen novels, short stories and poetry. She was an active suffragist, and member of the Woman Writers’ Suffrage League. 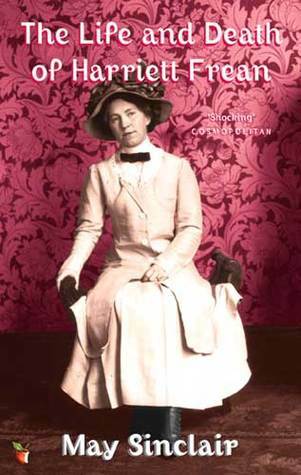 May Sinclair was also a significant critic, in the area of modernist poetry and prose and she is attributed with first using the term stream of consciousness) in a literary context. This book was published in 1922, but is not from my best seller list, so I have no idea how I came to download it from Project Gutenberg. Just another one of those mysteries of life.